Production Rate 100 to 120pcs/min. Single stage / Two stage. PERFECT SYSTEM established in 1998 & known as one of India’s leading manufacturer of Writing Instrument Machinery, Pharmaceutical Liquid Filling Machinery/Processing Plant and Fluid Dispensing System & Special Purpose Machinery. We strongly believe in customers satisfactions through high quality, efficient after sales service, timely delivery which contributes to increase the customer base. We manufacture a wide range of machinery, Ideal for use in: Writing Instruments, Automobile Industries, Jewellery, Electrical/Electronics Industries, Medical/Pharma Industries, Cosmetics Industries, Tin Industries, Paper Industries. 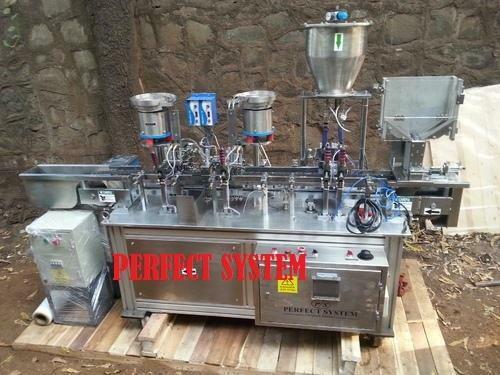 All types of pharmaceutical liquid filling machine/processing plants. Permanent /white board marker pen machinery. OHP/Cd Marker pen assembly machinery. Pencil ferrule eraser assembly machine. OTHER MACHINERY FOR WRITING INSTRUMENTS. Automatic Gel Bush Assembly Machine. All types of special purpose machinery as per your requirement. We manufacture products using superior engineering, new and updated design & Quality control systems maintained at every stage of production. Availability of in-house facility for mechanical testing - Non-destructive testing. We enjoy handling competitive jobs & specialized application. We plan to continuously upgrade our technology base to compete world quality standards and target to widen market for our wide range of products as well.